Otra Vida’s last visit to the Canaries was in October 2010, just before crossing to St Lucia with the ARC. 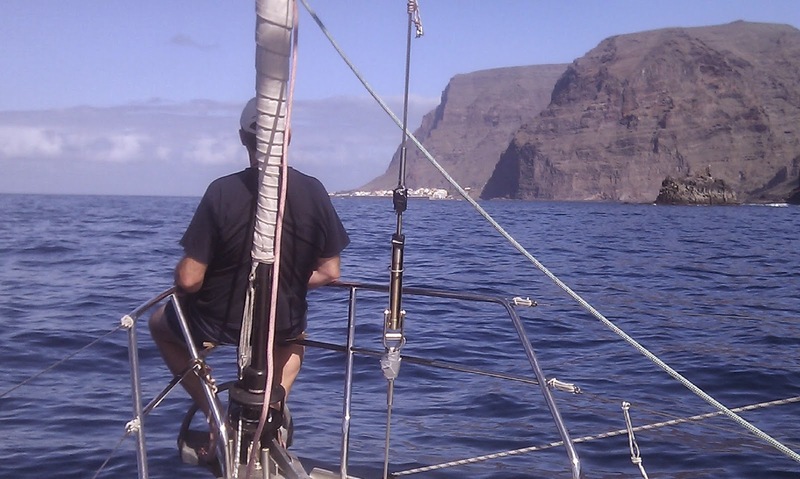 It was too short a visit: a memorable week in Graciosa, a few days in Lanzarote, and a couple of frantic weeks in Las Palmas preparing for the crossing and surviving the ARC pre-departure parties. This time we were determined to spend longer and explore the islands more. Landfall at Graciosa was at dawn after a windless 100% motoring four day passage from Rabat – our first New Year at sea, when the VHF came alive with New Year greetings in all kinds of languages: Spanish and French of course, also Russian, English, German, Arabic (I think) and several other languages that we couldn’t recognize. Maret added Estonian to that mixture. On board we celebrated with slow-roasted lamb and a reduction sauce, cava, and the Spanish tradition of 12 grapes at midnight – a brilliant piece of Ivy Lee-style marketing to resolve a grape glut in the 1930s that stuck, and which has ensured that no-one in Spain takes photos of each other at New Year’s midnight, as everyone has pouched cheeks with 12 grapes stuffed inside. 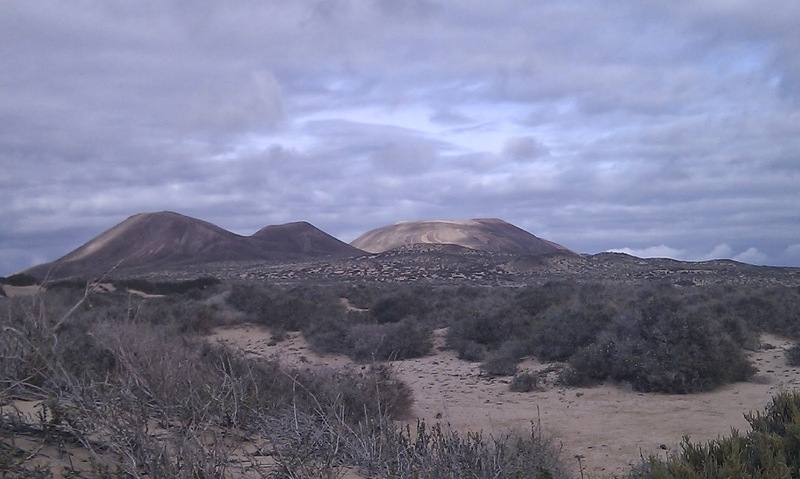 This time our visit to Graciosa was tranquil. The anchorage, which last time had about 30 boats, had just 3. Last time Wendy, Szilvi and I ended up partying with Dani, the local kingpin, and Rufi, his trusty sidekick, seemingly every night, either ashore, on Otra Vida, or on Dani’s farm in the uplands. This time they and their boat were not in evidence, giving our livers a pass on the serious workout that would have undoubtedly ensued. Following a drizzly week in Las Palmas getting our refrigerator fixed we headed south and started to learn about the very localised nature of high island weather. Being finally in the trade wind belt the big picture was fairly consistent N-NE-E winds of 12-20kts. However the wind behaviour around the islands is more complex: a bit like water around a rock in a stream. The water on the upstream side bunches up around the rock … this happens with clouds, so the NE sides of these islands are typically cloudy, and therefore somewhat cooler because of the reduced amount of sunlight. On the downstream side of the rock there is a slack-water eddy, similarly on the SW side of the islands there are rarely clouds or wind, and it is sunnier and warmer. On the sides of the rock, the water flows more quickly, logically, as the water bunched upstream of the rock has to go somewhere. This happens with the wind around the islands too, with “acceleration zones” to the sides where the wind can be 10-20kts higher than the prevailing wind. All this leads to interesting sailing conditions. Going E or W from the south of an island there are dead calm conditions for the period you are in the wind-shadow of the island, and then suddenly within 500m you are in strong winds, quite often 30+kts. In anchorages a few hundred meters can make a significant difference in the amount of cloud or the amount of wind you experience, and a 10 or 20 degree change in wind angle can turn an anchorage from comfortable to swelly and untenable. Anchoring and sailing here is never routine, and I’m grateful we were able to stay long enough to learn about it. It is knowledge that will be useful in the Cape Verdes and no doubt in island anchorages further afield. The biggest effects come from the biggest mountains. Mount Teide on Tenerife is the highest mountain in the Canaries, and in Spain. There is a cable car that moves you to 300m below the summit in minutes, and which is, apparently, the #1 tourist attraction in Spain by visitor numbers, a claim I find surprising. We chose a foot ascent instead, starting a few kilometres away from the cable car, hiking past Montana Blanca … pale yellow rather than white, and impressively stark with eroded hills and almost no vegetation. After a couple of kilometres of easy walking along pista we started the real ascent up a mountain path. Nothing difficult but considerably steeper. 3 hours later, passing through patches of snow, we arrived at the refuge, a pleasant enough place as refuges go, bizarrely offering wifi access, electricity and vending machines, but no meals or drinks service. The following morning we were away by 6.30am, and tramping through frozen snow and ice with crampons we watched the beginnings of sunrise far away over Gran Canaria. The sky slowly filled in with pink and tangerine as we continued along. There is only one officially sanctioned path up Teide, from the cable car station, but serendipitously we lost the faint path leading there from the refuge in the half light and decided instead to follow another older path up the steep scree slopes to the summit. This was nicely challenging, and as we later realised, a much more interesting choice. After scrambling the steep, loose last 50m to the summit ridge we were on top. The summit is wafted in hot sulphury steam from fumaroles in the summit crater and along the ridge – this is a sleeping volcano, not a dead one. 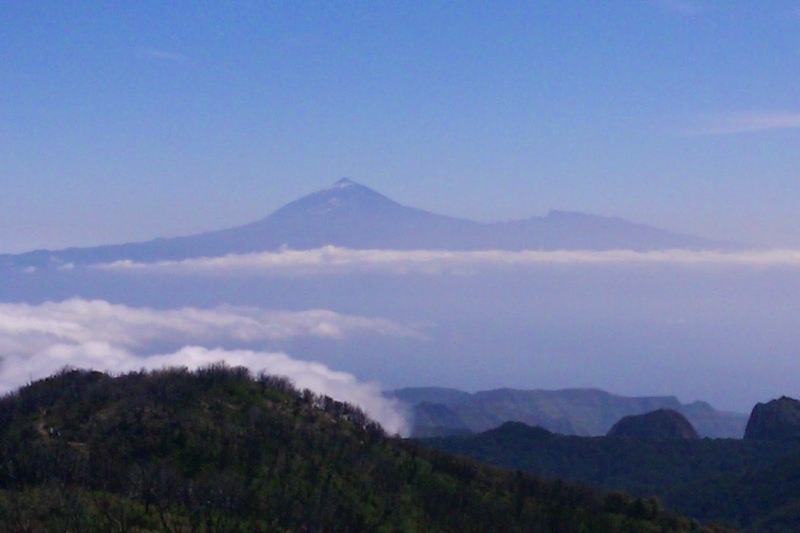 The now fully risen sun cast a perfect shadow of the triangular peak of Teide onto clouds well below us. After half an hour on top, and feeling a little nauseous from the sulphur fumes, we descended the official route down to the cable car station, where all other official routes on the massif converge. The route down is almost like a stairway, built from formidable stones and very well maintained, and designed for people in running shoes or even sandals to go up and down. Our route up, officially illegal, was far more satisfying. On arrival at the cable car station we were told that all routes (including the one we had descended from the summit) were closed because of snow! The rangers would not let us take our chosen onward route to Pico Viejo, or any other route, even with our crampons and faced with the obvious fact that by being there we’d already done some much more challenging walking that morning. They were apologetic, but said they were under strict instructions from their superiors. We descended the cable car and walked across the valley bottom through a pretty desert landscape to the Parador, where we had a room booked for the evening. Teide, while still a real mountain and wild in its moonscape ruggedness, has been tamed into a safe, controlled tourist attraction, almost a theme park. I do understand the desire to avoid accidents in a tourist attraction, but the mountains are a place of freedom, and something has been lost in the process of taming Teide. I wonder if the core issue here is one of judgement: the rangers could clearly see we were able to handle ourselves in the fairly mild conditions on the mountains, but to let us take a path would have meant a personal judgement, and how to explain that judgement and the potential commercial disruption if one of us had an accident, say a broken ankle? Ultimately the over-avoidance of risk results in the loss of passion, of pleasure, of adventure. It’s a balance, of course, and there are plenty of other mountains in the world that are not tourist attractions where we can roam freely. But still it is a little sad. After a relaxed day by the pool at the Parador we hiked to the rim of the caldera and did a long, long descent almost to the coast. The trail took us up into barren high desert, with patches of ice remaining in sheltered places, then through alpine pine forests, a high cloud forest with Spanish moss hanging from the trees, temperate forest, lush tropical shrubs almost like a planned botanical garden, a gorge with German rock climbers on the walls, and finally to a small village where we caught a bus back to the boat. A lovely day. Valle Gran Rey, on the western side, retains a contingent of aging hippies, mostly German. Headbands, scarves, baggy pastel-coloured trousers and wire rimmed granny glasses seem de rigueur. People use skateboards, scooters or highly personalised bikes to get around. On Sundays there is the hippie market near the bus station, selling handicrafts, hand-made jewellery, incense, muesli and hippie clothes. There’s a gentleness to the place, a feeling of relaxation. It reminds me of Aspen or Boulder in Colorado. 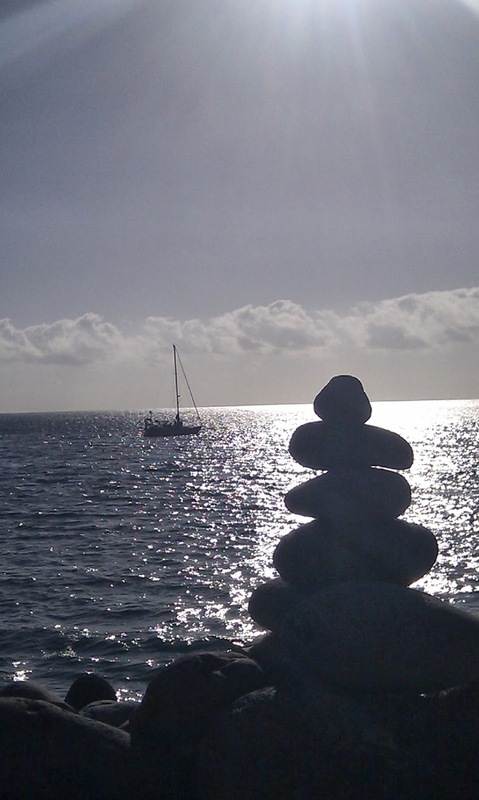 Sailing into Vueltas, the tiny port near Valle Gran Rey, and looking for a suitable anchorage through binoculars, I saw what appeared to be a person sitting on a stone beach underneath sheer cliffs. It seemed impossible to get to the beach, so I guessed it was some washed up clothing on a rock. Several days later Maret was exploring the area and came close to the beach. She noticed there was a removable ladder, a pair of running shoes with pristine white socks, and … living in a cave … a well-groomed single guy! So, single ladies, a prospect for you: a waterfront residence with a private beach and an eligible bachelor. Maret has the details. The island rises steeply up 1000m from sea level, then rounds out into a rather gentle and hilly interior plateau. There have been several major wildfires on the island, wiping out huge areas of shrubs, and leaving charred but mostly living palm trees. 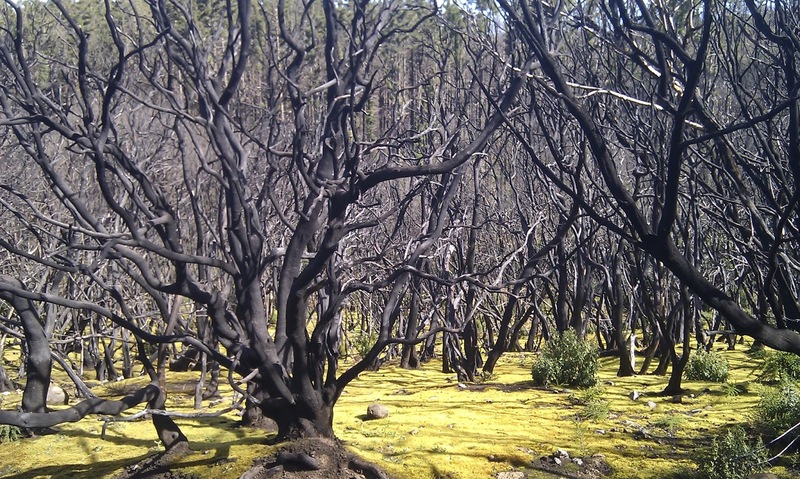 New shrubs have filled in the gaps from older fires, and the most recent, in 2012, has left blackened shrub skeletons against a carpet of pale green moss. In the steep valleys there are old agricultural terraces in the most unlikely places, often with impossibly green grass. 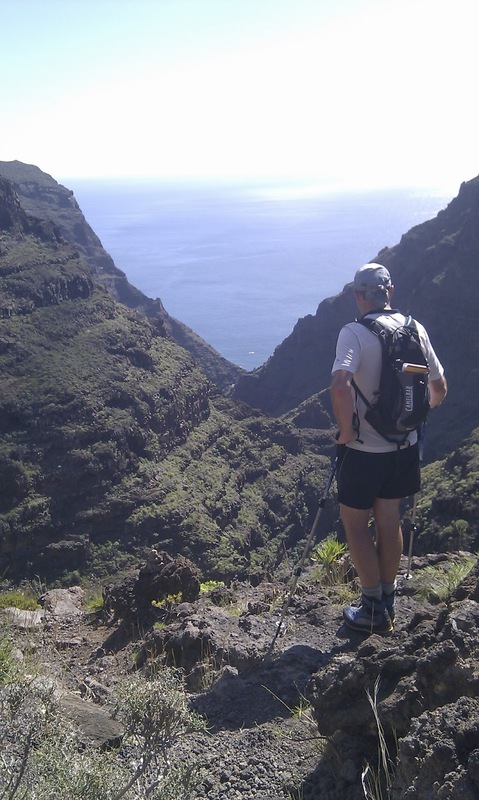 Hiking in La Gomera was a real highlight. The trails near the coast are spectacular, scaling seemingly impassable cliff bands through cleverly meandering paths. From our anchorage it was a short walk to the meditation hotel on the naturist Playa de Argayal, and the path next to it leads up a ravine, entering into a lost world of terraces, cliffs, easy scrambling, finally arriving at a tiny isolated church-ette perched high up on the side of a valley. Over two days we hiked to the summit of the island, Garajonay, where we had views across to Teide, piercing through the cloud layer and still showing traces of snow near its summit, and to the islands of El Hierro and La Palma, some 40+ miles distant and finely detailed in the ultra-clear air. Our hike back to Valle Gran Rey was via yet another clever, precipitous, fairly straightforward path down apparently impassable cliff bands. This is hiking of a very high quality indeed – “dream mountains of our Eden” to borrow a line from Jethro Tull. 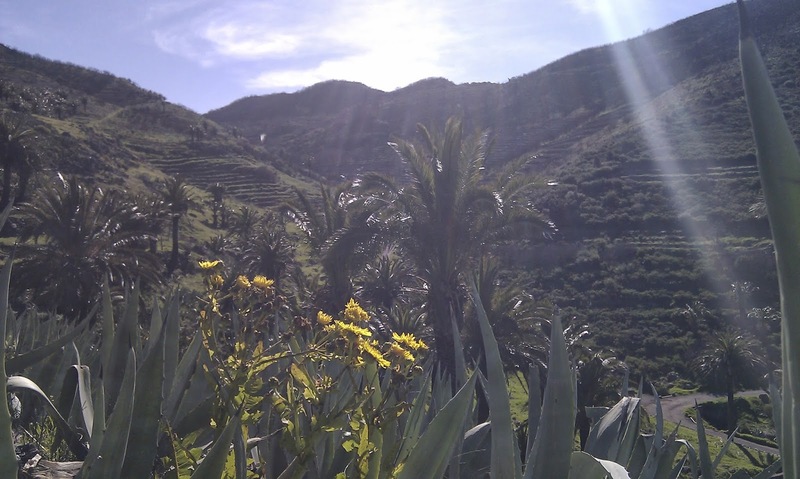 The Canary Islands are easy for us to spend time in. It’s 2 ½ months since we arrived, and it would be easy to spend longer here. We’ve visited just four of the eight islands, and there is still much to explore. Another six months would be straightforward. But it is time to get moving. Liz Clark is a surfer who decided to become a cruiser. 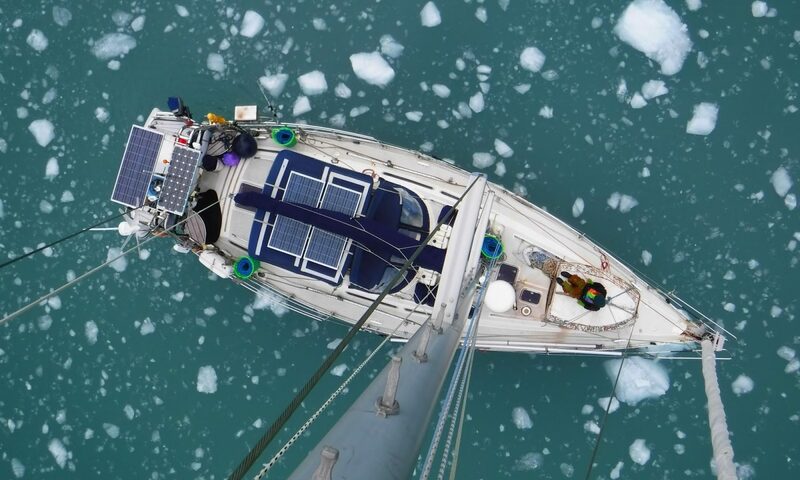 Her wonderful blog, The Voyage of Swell, tells the story and contains much good writing describing her boat challenges, life thoughts and her particular cruising approach (surfing, sunsets and salads). Unlike most yachties, Captain Lizzy actively seeks out places with great surfing … the rest of us try to avoid them, preferring calm anchorages. For the New Year she wrote a piece outlining her philosophy of life. It’s a good read, full of joie de vivre, perhaps edging on naïve at times, but so full of optimism and spirit that it is hard not to be inspired by it. A sentiment she includes in it: “I say that comfortable is caustic”. Our trip since leaving Estonia has been entirely in our civilizational comfort zone. Iberia is easy to enjoy; Morocco, while certainly different from Europe, is a place of great civilisation; and the Canaries are a variant of Iberia. There is much to like in all these places, and I’m grateful we have been able to enjoy them, learn from them, and hopefully give something back to the great people we’ve met. But the time has come to move on. Perhaps the curse of the Flying Dutchman? Or perhaps the wanderlust of the rootless cosmopolitan? Whatever it is, we have spent too long in our comfort zone, and we’re ready to point the boat south. The first stop is the Cape Verdes, islands which are most definitely not Europe anymore. I’ve noticed that sometimes borders between cultures can induce a concentration of cultural characteristics, making differences more stark. This is certainly the case in the area south of Maastricht, where the Dutch and French areas of Belgium come together. The Flemish villages on the border are more stridently Dutch than in the Netherlands, and the French villages are almost like film sets in their Frenchness. His English was excellent – very proper, well enunciated, not English learned from a book. We talked about our respective lives, travel, Morocco, sailing. Aziz was a Moroccan diplomat who was in Budapest for several years, 2005 being the year he left and the year I arrived. Reminiscences about Hungarian life, restaurants, places, people, politics. We knew people in common. He went on to India, then to Dublin, and is now back in Rabat sipping whisky at Le Trianon. The desire to enjoy, the pursuit of pleasure in these bars, brings to mind the words of the teenage protagonist in Vernon God Little, who, having participated in an evening of extraordinary debauchery in a Mexican roadside bar involving iguana impersonations, muses on how something in America seems to stop people really partying. I think the same is often true of Europe too. The falling-down-drunk tedium of Magaluf in the summer or Cancun at spring break doesn’t come close to the real thing. The crazy bars of Rabat are a little closer. We went exploring the desert close to the Algerian border during a visit from Annamaria. We hiked sand dunes for sunset and sunrise, tried snowboarding down them (Annamaria, an excellent snowboarder, fared better than Maret and I), and saw amazing landscapes … reminiscent of the US desert southwest, but with different architecture, and very different clothing. Most of the houses were build from adobe, and when these are not scrupulously maintained they slowly melt away. In one town we saw a whole neighbourhood that looked biblical in age. Our guide told us it was the old Jewish quarter, and that the residents had moved away “to build their country” in 1950s and 60s … just 50 years without maintenance and the houses already looked like ancient monuments. I loved the gentle way he talked about the Jewish residents leaving “to build their country”, and commented on it, which led him to explain the Berber approach to religiosity – how the berber flag symbolises Islam, Christianity and Judaism, and how Berber villages had historically been viewed as safe places for people of all religions. Would that it was this way everywhere. On the train to take Easyjet to the UK for my mother’s 80thbirthday celebrations, we’re sitting in a compartment with a middle aged Moroccan businessman, shoes off, quietly chanting religious devotions that he is reading from his tablet PC propped up on the table. Although dressed in western clothes, the dark thumb-print mark on his forehead tells that he is a devout Muslim. His gentle sing-song verses are interrupted from time to time by the aggressive chirping of his mobile phone, which he answers immediately, seamlessly switching from Allah to Mammon for as long as it takes, and then back. Morocco is modernizing everywhere. That is its right, of course, and it’s not a bad thing. My impression is that the government is trying to pull off what Japan has achieved: to become a completely modern place, while not losing their own culture, as all too often modernising equates to westernising. The results in Morocco are generally good, but there are exceptions. After the desert we went to the film studios of Ouarzazate, and then to the real life disaster movie called Marrakech. Really, what has happened to this place? Is this even Morocco? I’ve been here a half dozen times and remain unimpressed. It seems to me that the way to enjoy Marrakech is to stay in a lovely riad and to rarely leave it, something I did on one occasion. The city itself has little to offer in architecture and ambience outside of the riads, and Djemma el Fna, the main square that I used to consider the reason for staying one night in town, has become such an unpleasant experience that I can’t say I want to return here again. Even compared to 2010, the last time I was here, this has deteriorated into more of a circus. Constant aggression from touts means you are simply unable to walk on the square now … and if you don’t respond to their aggressive interventions you get a stream of insults. Maret was called racist more than once, I was called German (something I have no problem with, but their tone indicated it was meant as an insult). Just so unpleasant. Contrast this with our welcome after hiking in the Atlas mountains, arriving late at our small hotel where the owner, a mountain guide, had prepared a room for us with a wood fire to warm it up, and mint tea moments after arrival to fortify us. We had a similar reception arriving in the high refuge on Toubkal. Friendly smiles, caring people, almost overwhelming hospitality. In the Atlas mountains we had an interesting time pondering limits. I am not much of a fan of limits, especially my own, and try to ignore them. Goethe expressed this with an elegance of language that I lack: “To be pleased with one’s limits is a wretched state”. Our main hike was Jebel Toubkal, the highest peak in the Atlas and in north Africa. I’ve been up twice before, the first time on skis, the second in late summer, and was relaxed about the territory. The snow levels were still fairly low, so no avalanche risk, and the forecast was for bluebird skies. After hiking to the aforementioned refuge at 3200m we set off the following day for the summit, fairly quickly getting into cloud, wind and occasional snow. By the time we reached the peak, 4167m, it was no longer picnic weather … an estimated 50kts of wind, stinging blowing snow, instant rime on our jackets, an air temperature of perhaps -5C and wind chill very much below that. Not a place to hang around. The limits question came up during our ascent. Now, I might dislike limits, but in winter mountaineering you need to stay well within them … things can go from OK to serious to life threatening too quickly in the high mountains in winter, and you need reserves of energy to get out of difficult situations. (Not wanting to overdramatize, though – after all this was a day hike up a 4000m peak, not a Himalayan expedition). Whatever that percentage of reserve is (and in my mind it’s 25%) I certainly strayed a little into that territory … worrying for such a modest hike, and evidence of not enough running in the last year or two. Maret went very much closer to 100% … concerning to me, and we disagreed about whether that was OK. Ultimately everything was fine, we summited, started down, and although the inflatable santa remained packed and uninflated, 90 minutes later and 800m lower we were sitting in sunshine eating our picnic lunch. Rabat is a lovely city, and the marina – in a new development of modernity and tradition cleverly combined – is a delight to be in. The only real downside to the marina is getting in and out – there is a bar across the entrance to the Bouregreg river that is unpassable in more than 2m of swell for anyone not on a surfboard. Because of the high latitude north Atlantic storms thousands of miles away, 2m or less swell is rather rare in winter months. We therefore ended up in Rabat longer than expected (as was also the case in 2010). The main problem with this was that we had agreed to meet some of Maret’s friends in Tenerife for New Year’s Eve – something we were unable to do. Christmas in Rabat was quiet, as one would expect, although the Catholic cathedral in the center was well lit up, and there were a few shops selling Christmas decorations. We had a traditional Christmas day : a pre-lunch pub visit, in this case the very swanky Club Nautique overlooking the river, then lunch on board of turkey, roast potatoes, gravy, etc, followed by a Christmas pudding brought back from the UK earlier in December with brandy sauce. We were finally able to cross the river bar on 30th December for the 4 day passage to the Canaries, once again in almost zero wind, motoring. Once in the Canaries we should, theoretically, be in the trade wind belt … let’s see.